The right-wing extremist’s disregard for the Constitution is well documented, and now he’s reportedly joining Trump’s DHS. Donald Trump is shredding the Constitution. But he can’t do it on his own. He needs a lot of help to advance an agenda that aggressively assaults the rule of law, the separation of powers, freedom of the press, and the basic liberties of Americans. Trump’s got Attorney General Jeff Sessions on the job of attacking voting-rights and civil-rights protections. He’s got House Speaker Paul Ryan and Senate majority leader Mitch McConnell shutting down the system of checks and balances. But the work of undermining basic liberties is a big task, even for an authoritarian president, so Trump is reportedly calling in reinforcements. 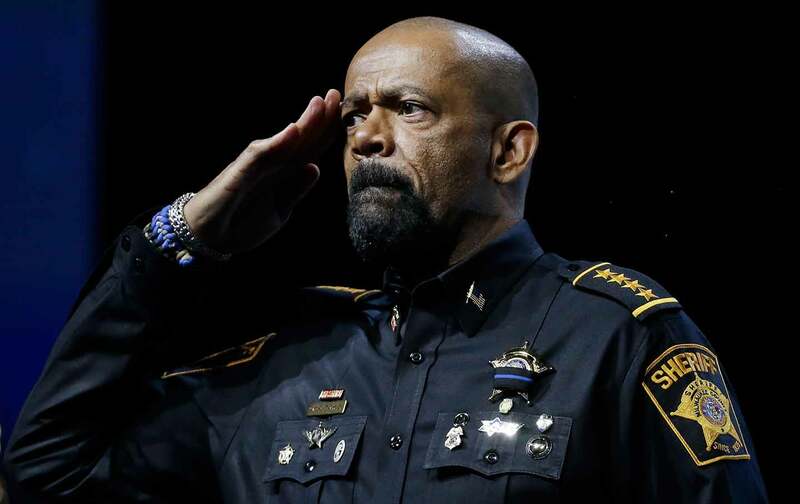 Meet Milwaukee County Sheriff David Clarke Jr., an ardent ally of President Trump and Wisconsin Governor Scott Walker, who announced on Wednesday that he would leave his elected post to become an assistant secretary in the Trump administration’s Department of Homeland Security. Though DHS officials have so far declined to confirm the move, Clarke says, “I’m looking forward to joining that team” as a top official in the department’s Office of Partnership and Engagement that coordinates DHS outreach efforts to state, local, tribal, and territorial governments and to local law-enforcement agencies. If Clarke gets the job, he’ll arrive as an over-the-top Trump apologist who makes the president’s bluster about “enemy of the state” journalism and religious targeting of refugees seem mild by comparison. Clarke refers to progressives who advocate for equality and equal protection under the law as “rat bastards on the left.” And he leaves little doubt about what he would do with power. Clarke’s new book, Cop Under Fire: Moving Beyond Hashtags of Race, Crime and Politics for a Better America, is packed with “we are at war” language and talk of operating “under a war time model.” He advocates for rounding up Americans who are perceived as threats, suspending their rights, holding them indefinitely, and handling cases with military tribunals rather than the courts. This is nothing new. On Clarke’s radio show, The People’s Sheriff, he advocated for suspending the writ of habeas corpus (America’s historic protection against unlawful imprisonment) and for shipping suspects off to Guantánamo Bay. What kind of numbers is Clarke talking about?